Stanbridge College has been named to the 2015 President’s Higher Education Community Service Honor Roll by the Corporation for National and Community Service for the seventh consecutive year. The award is the highest federal affirmation a college or university can receive in recognition of its commitment to service-learning and civic engagement. The acknowledgment underlines Stanbridge College’s extensive efforts to bring positive change to both the local and global communities. “Service and higher education go hand in hand,” said Ms. Wendy Spencer, CEO of the Corporation for National and Community Service. 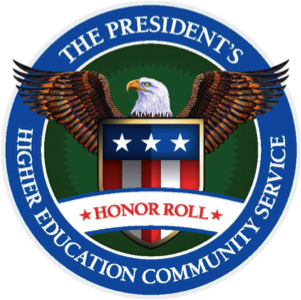 “The President’s Honor Roll annually highlights the role colleges and universities play in solving community problems and placing more students on a lifelong path of civic engagement by recognizing institutions that achieve meaningful, measurable outcomes in the communities they serve. Throughout the 2013 – 2014 academic year, Stanbridge College developed and strengthened both new and well maintained, long-term community partnerships with non-profits. Such partners include the Autism Speaks Foundation, the Alzheimer’s Association, Southern California Special Olympics, the Free Pantry Organization, the Downtown Dog Rescue, OC Parks, Second Harvest Food Bank of Orange County, the Illumination Foundation, and Irvine Animal Care Center. To learn more about our community service projects, please visit our REACH page to read more. For more information on our school and our service learning opportunities, please visit our website.